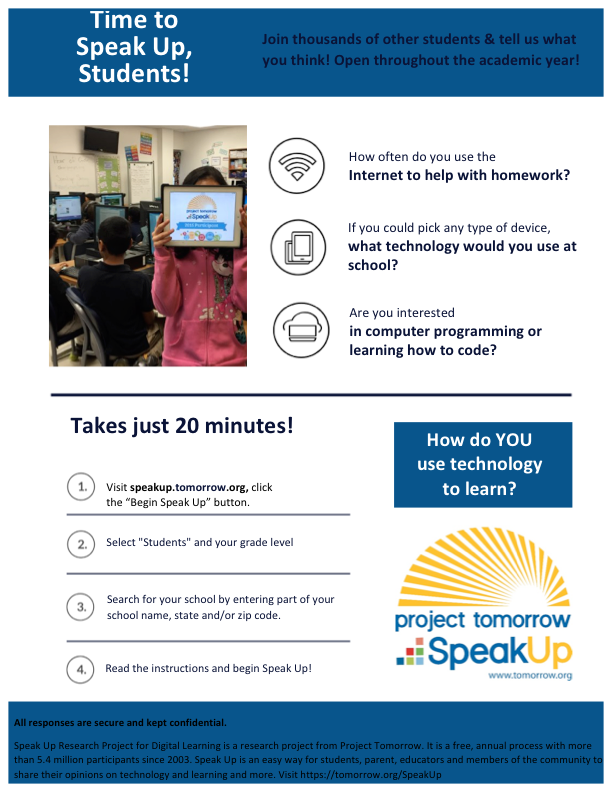 The Speak Up Student flyer is an easy way to share the Speak Up URL to participants. We recommend posting this flyer around your school(s) or to send home with students as a way to get their parents involved. There are three versions of this flyer depending on how you are directing your participants to take the survey. Our general version includes instructions on how to participate using the link Speakup.tomorrow.org. The district direct version, is to be used if your district has set up the district direct custom landing page that includes links for all of your schools. The school direct version, is if you are using the school and audience specific links that drop participants off right at the start of their appropriate question set.